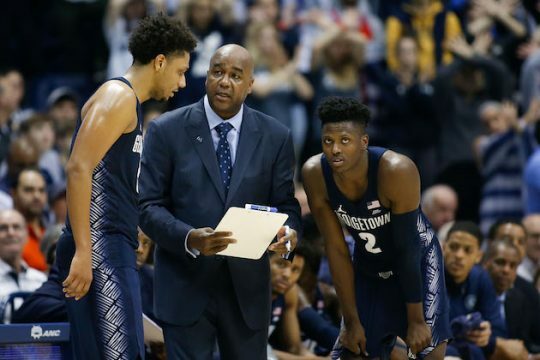 Yesterday we learned that Georgetown University let go its men’s basketball coach, John Thompson III, after 13 seasons—the last 2 being absolutely dismal. I am still in shock. Mind you I’m not shocked because I find it unfair to him or that he just needed more time. Rather, I’m shocked the administration had the guts to let him go. Georgetown is not only severing ties with a coach but also a dynasty that’s ruled for 45 years. It began in 1972 when John Thompson Jr. (aka The Old Man) came in to salvage what was left of the Hoyas program. His predecessor John Magee finished his final season at 3-23. Thompson, as everyone knows, turned the basketball program into a powerhouse that, in the 1980s, led to three Final Four appearances and a national championship. In any event, Thompson himself pulled the trigger with his resignation midseason in 1999, just four games shy of 600 wins. Longtime assistant Craig Esherick took over, but the program continued to flail (as I complained about at the time). He was dismissed in 2004. Then came the son, John Thompson III, who had been an assistant to coach Pete Carril at Princeton. In almost no time, the Hoyas were back. In his first season, JTIII got the team to the quarterfinals of the NIT. The following year Georgetown, then unranked, beat Duke. It was one of those moments for the Hoya faithful—they still remember exactly where they were when it happened. From there it was off to the NCAA Tournament where they lost in the Sweet 16 to the eventual champions, Florida (and the dreaded Joakim Noah). It was a respectable loss that was quickly forgotten when, the following season, Georgetown returned to the Final Four (the first time since 1985) after defeating North Carolina in overtime. That team was led by Jeff Green and Roy Hibbert (Esherick recruits)—but it was Jonathan Wallace who made the most crucial shot. But the last two seasons were simply abominable—both ending below .500, which hadn’t happened since the team was coached by John Magee. Under other circumstances, the coach would be toast. But because the coach’s father is a legend—his name is on the new multimillion-dollar campus athletic facility—the situation was a bit sticky. And so it was rather surprising to read the official statement from university president John J. DeGioia, which opened with this sentence: "It is with profound regret and deep appreciation that I informed John Thompson III this morning that the University will no longer be retaining his services as our Head Men’s Basketball Coach." So he was fired? "There’s no doubt he was fired," the sportswriter John Feinstein tells me. "I'm a little surprised; thought he’d get another year—thought he should get another year." As for the program’s future, says the author of Season on the Brink, "There’s no way to know what comes next until we know where Big John stands on this. If he’s okay with it—which I’d tend to doubt—all sorts of candidates are possible: [Tommy] Amaker, [Patrick] Ewing, Richard Pitino, [Tom] Crean, Archie Miller, Joe Dooley. If he’s pissed, several of those guys—Amaker, Ewing at the very least—wouldn’t touch it." As of this post, it still remains uncertain where the elder Thompson fits into all this. Says Feinstein, "I find the silence of the Old Man deafening." This entry was posted in Culture and tagged Basketball, Georgetown, Hoyas, John Thompson. Bookmark the permalink.